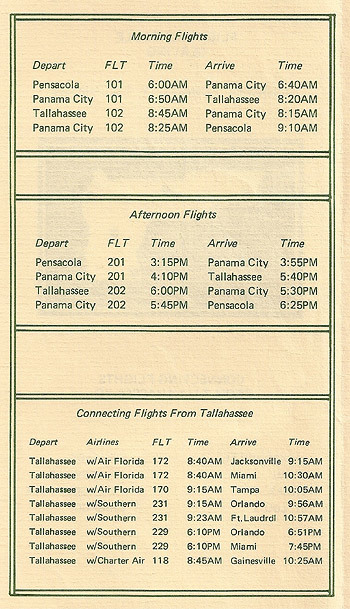 Panhandle Airways was incorporated in December 1976 and commenced flights between the Florida panhandle cities of Pensacola, Panama City and Tallahassee in 1977. The airline flew Beech 18s and also leased a Douglas DC-3, N4996E, from Florida Airlines for a short period. Panhandle Airways ceased operations in early 1978. The following scans are from an undated timetable circa 1977. 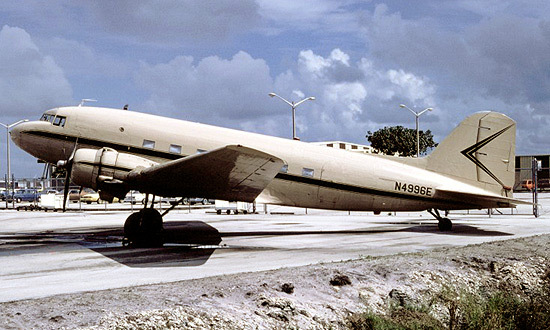 Although the Beech 18 was the primary aircraft type flown by Panhandle, the airline also leased Douglas DC-3 N4996E (msn 12141) from Florida Airlines for a brief period. Shortly after the end of its airline career, N4996E was destroyed during a drug smuggling run when it ground looped in a Florida sugar cane field on December 14, 1978.